Need a culture fix? Avoid that overheated London bound train like the plague. An awesome exhibition of artist Nick Schlee’s drawings has just opened at Mallett Showrooms, Donnington Priory near Newbury. 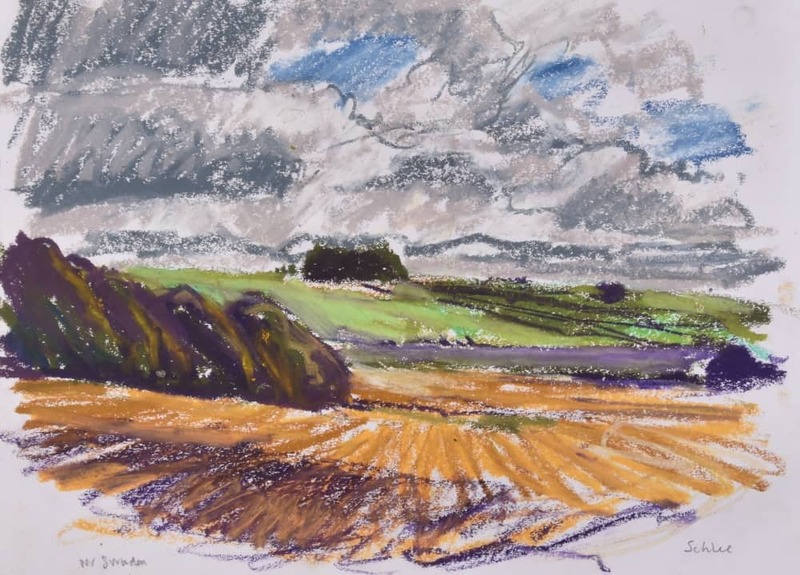 Drawn To the Ridgeway is on until Tues 31 July, so you still have plenty of time, but you know how things go – you clock an exhibition, roll it around your headspace for a while, decide to go, forget about it for a while, and then never make it at all. So this is your big fat clock alarm to schedule a visit. 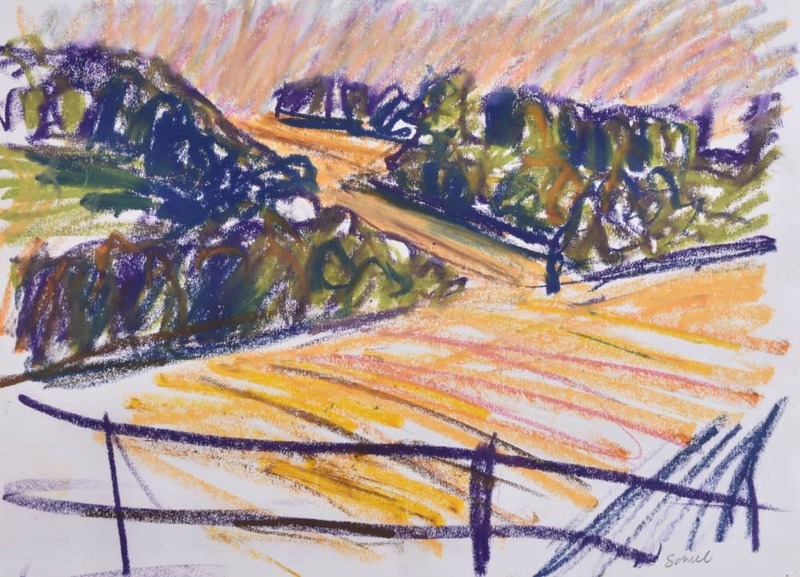 Nick Schlee is a local artist – aged 87, he lives with his wife in Upper Basildon, where he still draws and paints in his studio to this day. 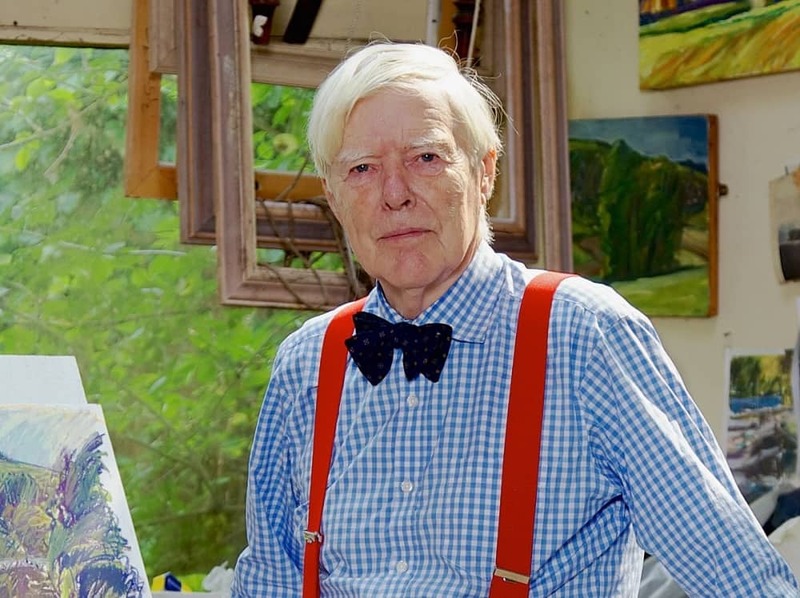 Nick spent most of his working life in business, using weekends, evenings and holidays to pursue his passion for painting, squeezing in classes at New York’s Art Students League, Central School, Morely College, Putney Art School and The Slade. At the age of 58 he ditched the corporate world for a creative one and has be painting ever since. 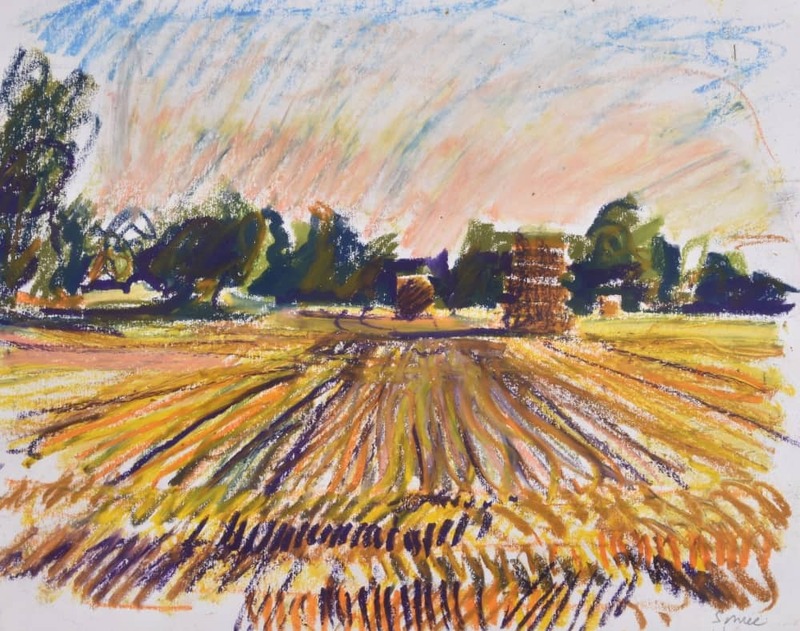 A curated collection of 36 drawings is currently on display in the newly created exhibition space at Mallett Showrooms (part of Dreweatts Auctioneers). 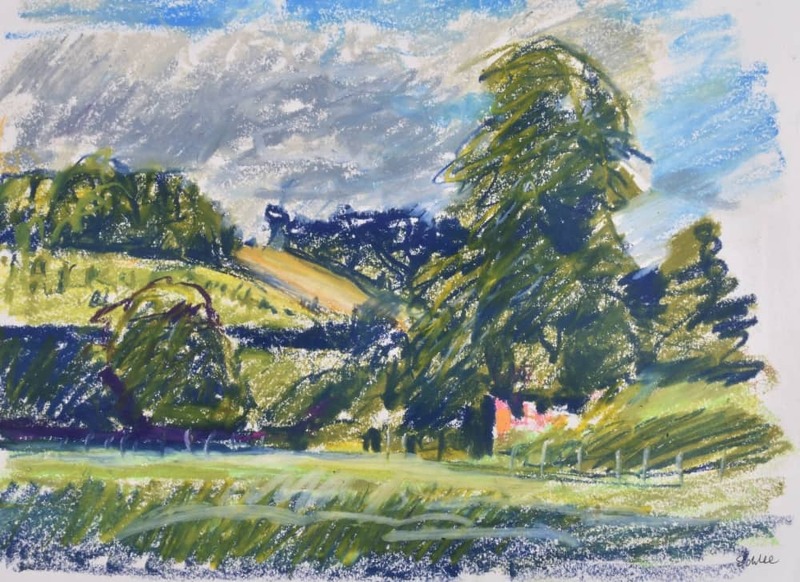 The landscapes of the Ridgeway – an ancient 87-mile trail stretching from Avebury in Wilts, through Berkshire to Ivinghoe Beacon in the Chilterns – is one of Nick’s favourite stretches to paint and it looks pretty foxy on the priory’s griege walls. This is not a white, intimidating space, it’s deliberately homely so that you can visualise how cool a multi century mash up can look – subtle drawings, sitting alongside traditional gilt framed pieces and large contemporary oils – in rooms so elegant, I’m thinking of moving in. Virtual hiking boots on, our meeting point is Avebury, about 4 miles from Marlborough and home to the largest henge in the country. Forget Stonehenge, this is where it’s at. Drawn To The Ridgeway starts way out west in Avebury, dipping into South Oxfordshire while weaving in and out of West Berkshire. Dating back to 1994, all the artworks were made on the spot using oil pastel and pencil– no photographic cues, rough sketches, or need to rely on memory (not that the Muddy brains cells would be up to it). Schlee says that before he pulls out any of his materials, before making any mark, he creates a word description on a mental filing card of exactly what stopped him in his tracks and choose the location. His subsequent drawing features only what is on that mental filing card, anything that distracts from his first observation is edited out. Hackpen Hill (5 miles on from Avebury) is better known for its white chalky horse cut in to the hillside, one of eight in Wilts. I’m, not sure how you go about creating anything on that scale, but Nick never falls into the tourist trap, focussing instead on the colour, light and drama. Nick also works at speed. Ditch the cliches of artist, easel and hours perched in a field capturing the scene, it’s all about capturing the essential spirit of the landscape, using strong energetic strokes and exploiting the dynamics of pure colour. A whopping 27 miles further down the trail this drawing was created near West Ginge (brilliant name). This section of the Ridgeway used to part of Berkshire until boundary changes in 1974 an they handed it over to Oxfordshire. I’m thinking it’s time we reclaim what is rightfully ours. 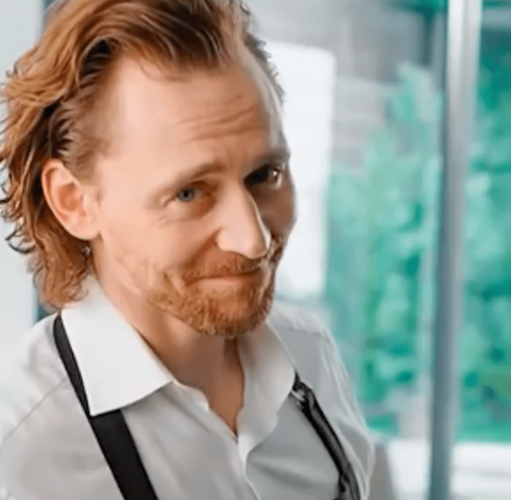 I don’t know about you, but I’m gasping for a drink. I reckon we’ve put in a shift by his point, so a large glass of something cold is well and truly in order. Streatley, 12 miles on from Ginge, is a beautiful spot as it crawls downhill to the Thames. Put your feet up at the Swan at Streatley and take in the view surrounded by weeping willows and water. As Nick’s image suggests, it’s green, lush and rich, in more ways than one. House prices round these parts can be eye wateringly expensive. 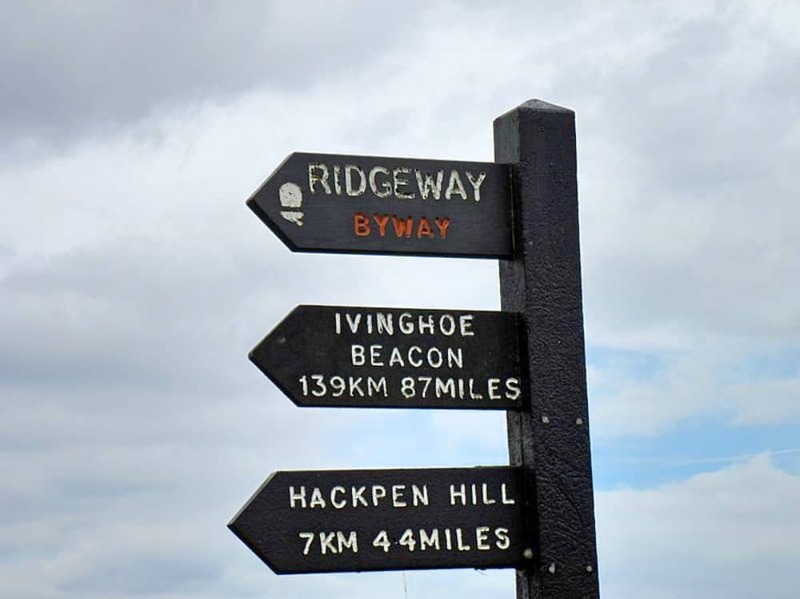 Strictly speaking Upper Basildon isn’t part of the Ridgeway trail but, Nick’s gotta head home at some point, so I thought I’d pop this one in too. 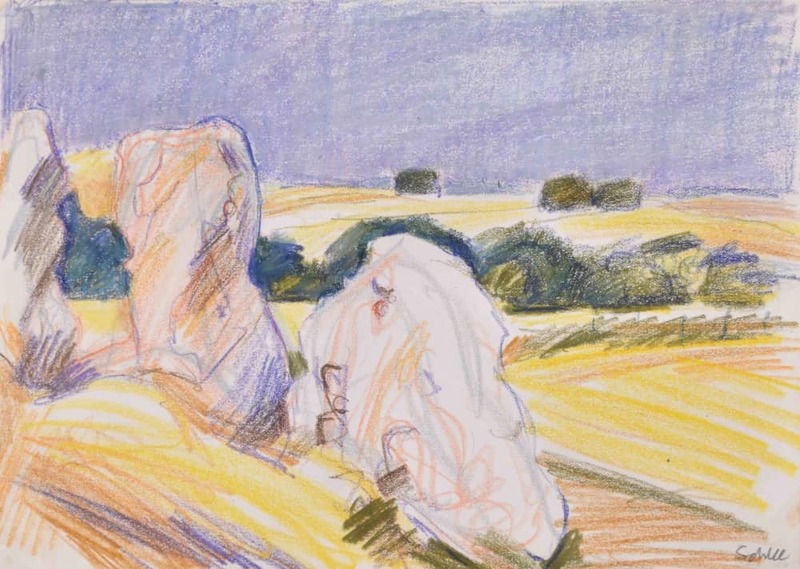 This exhibition focusses on Nick Schlee’s drawings he also creates large oils too. His work can also be seen at Reading Museum, River & Rowing Museum, City of London Guildhall Gallery, to name just a few. In the meantime go and see Drawn to the Ridgeway, then head down the road to see chef Dom Robinson at The Blackbird for a spot of lunch.